The heavy rains this spring and early summer have put a serious damper (pun intended) on our progress with the cultivated plants on the farm. Many northeastern flower growers report a two week-one month (and growing) delay. Things are coming along, but slowly. We're starting to harvest our first snapdragons from seed, the recently transplanted peonies are settling in and tempting me to take up the snips, and my collection of yarrow is erupting. The rains have forced me to look more and more to foraging for floral elements for our customers, and in doing so, I've come to learn more about the history of our farm and which kinds of plants flourish here, despite the climate and growing zone that is often viewed as inhospitable. I'm also growing adept at identifying different species, including the invasive ones. There are a few common, invasive plant species that have become a staple in my designs this month. I've loved these at every stage so far. *Before you read on and get inspired to grab your flower snips on the way out the door, be sure that you are harvesting from your own property or one that you have permission to be cutting from. Never cut down an entire plant, if you want it to grow back again. Take care to harvest only what you need for your project, unless you are getting rid of something that is taking over your apple trees, etc. Bush Honeysuckle. There is no question that it takes over. We have pink and white varieties on the perimeters of the farm, and, much to my dismay, they are crowding out established apple trees. I don't love those aspects of the honeysuckle. But I do love that it leafs out early. I use it first for it's bright, lime green foliage, then for it's tiny sweet-scented blossoms, and now for it's darker foliage and green berries. Arrowwood Viburnum. I found these small trees/bushes at the edges of the property, too. They don't seem to mind wet areas. Their tiny twinkling star-blooms appear in round disc masses. As I harvest them, I strip off all or nearly all the leaves. You have to do some careful snipping around the head of the flowers, but the results are worth it. As the viburnum drops its flowers, the spiky remnants add texture and interest to bouquets. Later, I'll harvest them for their dark blue berries. Chokecherry. Chokecherry announces it's arrival in spring with lovely bursts of linked white flower chains. They look like little sprays of miniature crabapple blossoms, about the size of a cheese puff. The blossoms are followed by funny groups of green berries that are perfect for draping over the edge of a vase or adding movement to a bouquet. 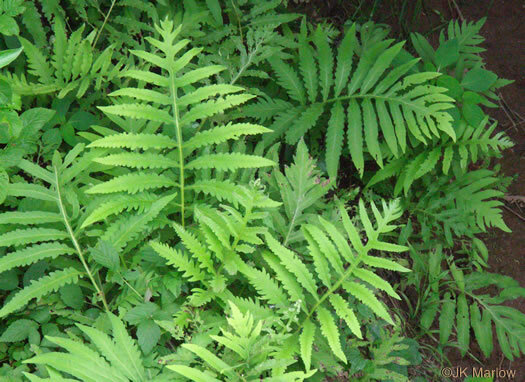 A broad leaf fern (Sensitive Fern) is my current favorite green. It goes limp quickly when out of water, so it isn't a good candidate for my farmers' market bouquets. I'm slipping it into some prepared arrangements. It is gorgeous and has a good vase life if it will stay in water and relatively cool. If you look beneath the umbrella of leaves, you'll find stick straight stems of the fern's spores, sori. They look like a bunch of small, glassy maroon beads - hence the plant's nick name, Bead Fern. These stand in striking contrast to the light green leaves. They are a great dried floral element. For flowers, you can't beat lupine, wild daisies, white campion, yarrow and rudbeckia . We were fortunate to be granted access to a friend's lupine field before our first farmers' markets. Lupine are beautiful growing wild in open meadows. They require well-draining, sandy soil- the opposite of what you'll find on our farm. Wild daisies and yarrow run rampant along the edges of the road, and they've found their way into my work recently, too. The rudbeckia is just starting to bloom in Jay. However, right now, I'm smitten with purple clover. You can find long stems with large blossoms growing out of ditches at the edge of the road. On a whim I started harvesting some. Before I knew it, I had a bucket full. When I leaned down and took a smell I was transported to my childhood. After dandelions, clover was probably one of the first flowers I smelled. I also love crown vetch (blooming now). All of these have a good vase life. Where is the line between designing with weeds and providing clients with an experience that evokes memories or asks them to reconsider something that we all take for granted? I think it has to be in the arranging- in the careful pruning of each stem, in the way the "ingredients" combine. There isn't anything more local than working with the plants just outside your door, especially the ones that keep showing up each year in spite of the weed whackers of the world. What are your favorite plants to forage for? Please share in the comments!